There are currently an estimated 2,784,500 customer service representatives in the United States. The customer service representative job market is expected to grow by 4.9% between 2016 and 2026. How employable are customer service representatives? CareerExplorer rates customer service representatives with an A- employability rating, meaning this career should provide great employment opportunities for the foreseeable future. Over the next 10 years, it is expected the US will need 143,800 customer service representatives. That number is based on 136,300 additional customer service representatives, and the retirement of 7,500 existing customer service representatives. Are customer service representatives in demand? Employment opportunities and demand for customer service representatives are expected to grow significantly for the foreseeable future. This is due in large part to the expansion of several industries which operate telephone call or customer contact centres to consolidate sales and service functions. While some companies are increasingly using online self-service or interactive systems that enable customers to activate such items as address changes and billing procedures without speaking to a representative, many internet-based and other companies rely exclusively on their call centre representatives to manage more complex issues, including customer sales, service, loyalty, and refunds. Consequently, employers may seek to hire representatives who have education beyond high school. 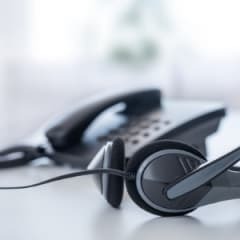 Although technology is making it feasible and cost-effective for call centres to be relocated outside of local business markets, consumers are increasingly expressing their loyalty towards companies which employ domestic manpower. Recognizing the importance of any competitive edge that increases retention of customers and emphasizes client relationships, companies are responding to this customer preference. This is particularly true in the financial services industry and the communications and utilities sectors. Competition for customer service jobs in the finance and insurance fields is projected to be especially robust, in view of the higher salaries associated with these positions. Although technology has tempered growth in these industries, it has also created new opportunities. Online banking, for instance, has reduced the need for telephone banking; but it has led to a greater need for customer service representatives who assist users with banking websites. Across all industries, job seekers in customer service who are bilingual typically enjoy better prospects. Numerous and ongoing openings tend to result from the need to replace workers who leave the occupation. Replacement needs are typically significant in this large occupation which employs many young people who eventually transfer to other jobs. As many call centres remain open for extended hours per day, the occupation is well suited to job seekers who prefer flexible work schedules or part-time employment. Another positive of the customer service field is that it is not as vulnerable to layoffs as some other sectors. Economic downturns may impact the degree to which customers make purchases or invest their money, but they generally continue to have service needs regarding their accounts and customer profiles. Customer service roles are frequently excellent stepping stones to more responsible supervisory or management positions, in which the knowledge gained from interacting directly with customers regarding products or services often proves to be indispensable. What’s the supply of customer service representatives?